I’d been a keen sportsman throughout my school years and had always run (or jogged more likely !) as part of my general fitness but I was more of a sprinter to be honest and had always thought that serious road running was for those with longer legs! 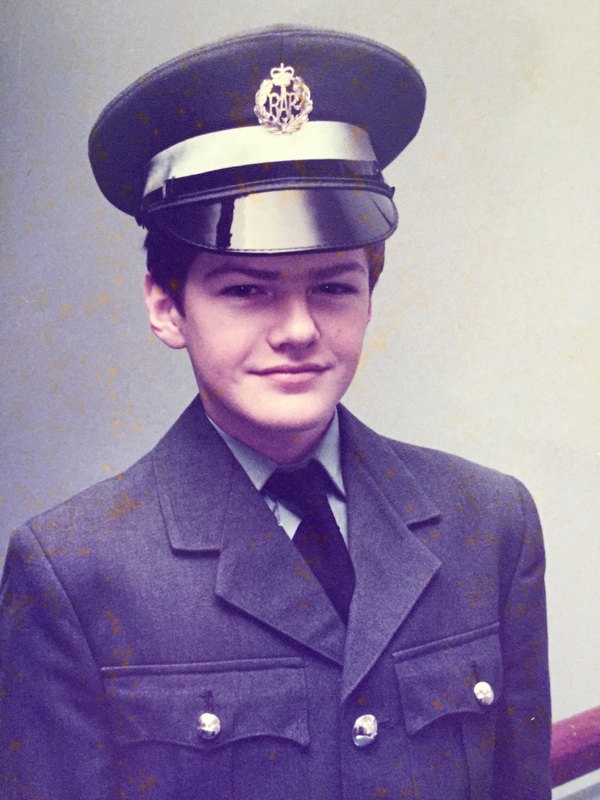 Some of you may have noticed that I’m not the tallest on the block and actually I was only 5ft tall when I left school and joined the RAF back in 1980. Throughout my RAF career I continued to enjoy all types of team sports and achieved some success in my glory years of 5’2’’ to 5’4’’ when I became the shortest player to represent the RAF at basketball and the smallest to play at scrum-half for the rugby union side. Playing rugby at the same time back then was a certain Flight Lieutenant Rory Underwood who played for the RAF in his spare time when not competing with Leicester Tigers and England and I did get to race him over the 100m distance on one occasion and narrowly lost by 1.5seconds, (my 12secs to his 10.5secs) which probably equated to about 20mtrs 🙂 I left the RAF in 1993 having reached the dizzy heights of 5’6 ¾’’ (or 5’7’’ in my trainers !!). It wasn’t until 2009 though that I actually entered my first road race, the Belfast marathon ! I signed up to it as part of a drunken bet with a friend of mine, a tradition that continues to this day (see below!). The only other race I had taken part in prior to that was a 10k race in the Cotswold village of Bourton-On-The-Water which I did as part of my ‘training plan’ in order to get an idea of how a race event actually worked in terms of logistics etc. If I guessed that I completed 100miles of training leading up to the marathon then I’m sure I’d be exaggerating, and it definitely showed when I limped across the finish line in tears and in a time of 4hrs 50mins. Actually having been so naïve (nay stupid !) about what I was taking on, and having been so poorly prepared then to finish at all was something of a miracle. 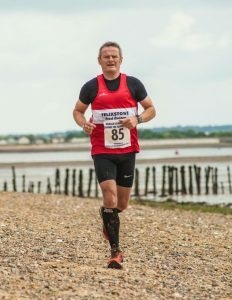 Having said that, once I had recovered some months later I did find that I was enjoying road running and found myself running on a more regular basis, although still in a completely unstructured way. 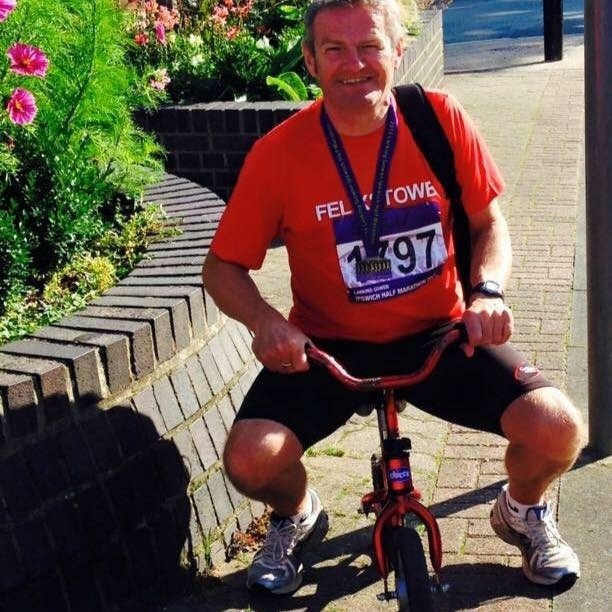 That all changed when I moved back to Felixstowe a few years ago and eventually joined FRR in 2015 following some friendly advice from both Michelle Gordon and Adrian Hine. Great advice and truly appreciated. Manchester marathon on April 2nd is the next big test for me, and I also drunkenly (I mean keenly!) signed up to take on the SVP100 in August which will be my first (and last !) ultra. There will be other events dotted along the way of course but those are the two big targets for this year. 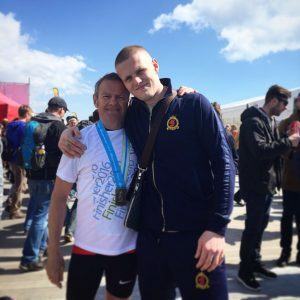 My favourite race so far has to be Brighton marathon 2016 which was to be my first sub-4hr marathon and which was made that bit more special by being welcomed home on the finish line by my son JJ (he’s the short one on the right of the picture below!). JJ is not a runner himself and although he was kind of aware of all the different runs I did as part of my training program I don’t think he truly understood what goes in to preparing for and competing in a marathon event until he came and watched the race for himself. To be greeted at the end having achieved my ambition and to be told how proud he was of me was a pretty special moment. I did go on to complete a sub 3:45hr time at Leicester in Oct’16 but as some of you will know that race was run for very different reasons and so it will remain as the tribute it was intended and not celebrated in the same way as other achievements. 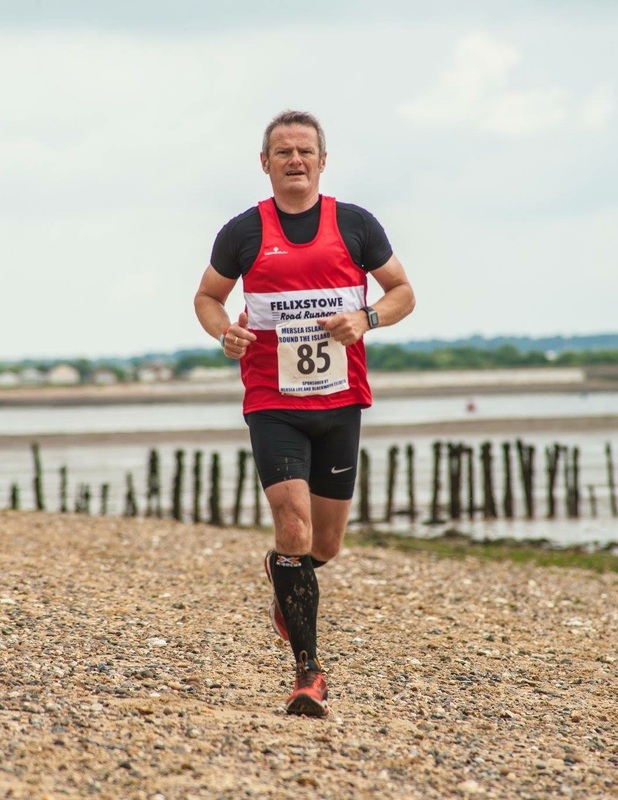 Another favourite race of mine is the Ipswich Twilight 10k which although still in its infancy is proving to be a real success with great support and a cracking atmosphere around the town. Last year’s event saw me score my first sub-45min time for the distance and I even managed to ‘hold off’ Dazza until the last mile when he then effortlessly cruised past me and finished a couple of minutes ahead, which was quickly put further in to perspective when I was reminded that he’d already competed in the proceeding 5k race and whipped around that in 18mins! I was also pipped on the line that day by David Seymour, Erika Downs and Dan Clark but I should probably leave that as just said and move on to my favourite moments. I love these mini rivalries that occur and my sincere thanks go to Dan, David, Erika and also to Jess Farthing (aka Carita! ), Adrian Hine and Not So Slow Paul who have all at some point (probably unknowingly !) inspired me to push on and do better. I also enjoy and am grateful for the advice and encouragement I have received from other more experienced athletes (namely the elites !!). A particular example was as I got close to the Brighton marathon and my confidence of achieving my goal was at its lowest, so a verbal kick up the backside was timely and truly appreciated.. thank you to Lucy, Michelle and Solly. I would also like to acknowledge all of our run-leaders who give up their time voluntarily to help us all in our quest to do better and whose efforts are truly appreciated, and to all of our family and friends (a lot of whom actively support the club) without whom none of our achievements would be possible. Most of all though I love the banter amongst us all, and long may that continue. The April fools honour can in my opinion only go to one runner, so prepare yourselves for the air to turn blue and welcome to the stage the one and only Mr John Glanfield ! Great read Shaun. Witty informative and inspiring in equal measure.